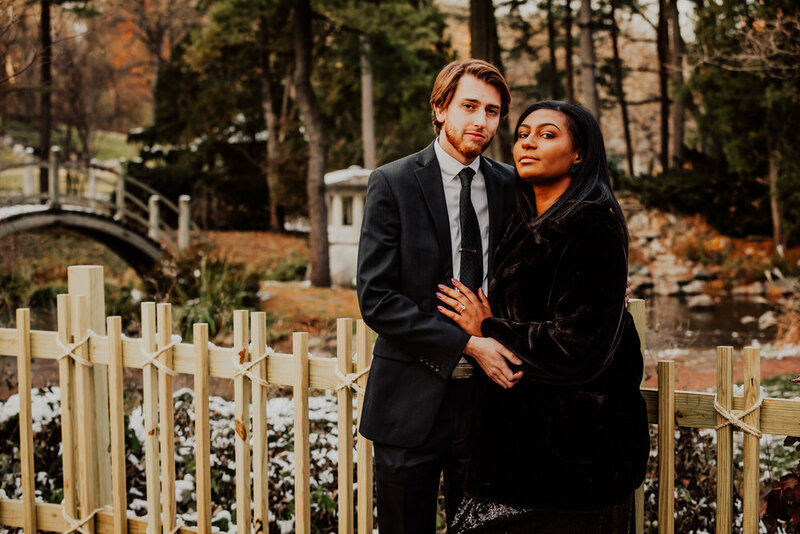 Shaina and David had a vision for their engagement photos.They wanted drama, romance and class. We brought their vision to life at sunset in freezing temperatures at a local forest preserve. Hidden hand warmers and their love kept them warm. They were full of ideas and suggestions and our time together flew by. It was such an honor to work with such a fun couple! Shaina and David met on October 8, 2017. They chatted for a few hours and they actually decided to meet that same day! They met at a local park and after walking for a few hours, they decided to get a bite to eat at a local ale house. The date went on for a few more hours, lots of talking, laughing, and getting to know each other! Around 10:30, they decided to leave. David walked Shaina to her car, looked at her, and kissed her. They went out every other night after that (David can recall ALL of the events of the first week), and finally that following Sunday, they were having leftover pizza for dinner, he looked at her and said with a straight face, "Shaina, I know this is cheesy, but will you be my girlfriend?" David took Shaina to the park where they first met (and they happened to be wearing what they each wore when they met each other for the first time as well), and they went on a brief walk. When they were walking back, Shaina was getting hot, and wanted to go to his car, but got distracted by a monarch butterfly. When she turned back around, she thanked David for their date, and then he said, “I love you so much, and I’ve been so happy all the time I’ve been with you. I’m forever yours, faithfully (the song he first said ‘I love you’ to).” He paused, and looked at her left hand and said, “Let me see your finger in your left hand. Hmm...it looks a little bare! Let me see what I can do about that...” He then got on his knees, said her full name, and asked her to marry him. Shaina's sister filmed and photographed the whole proposal!